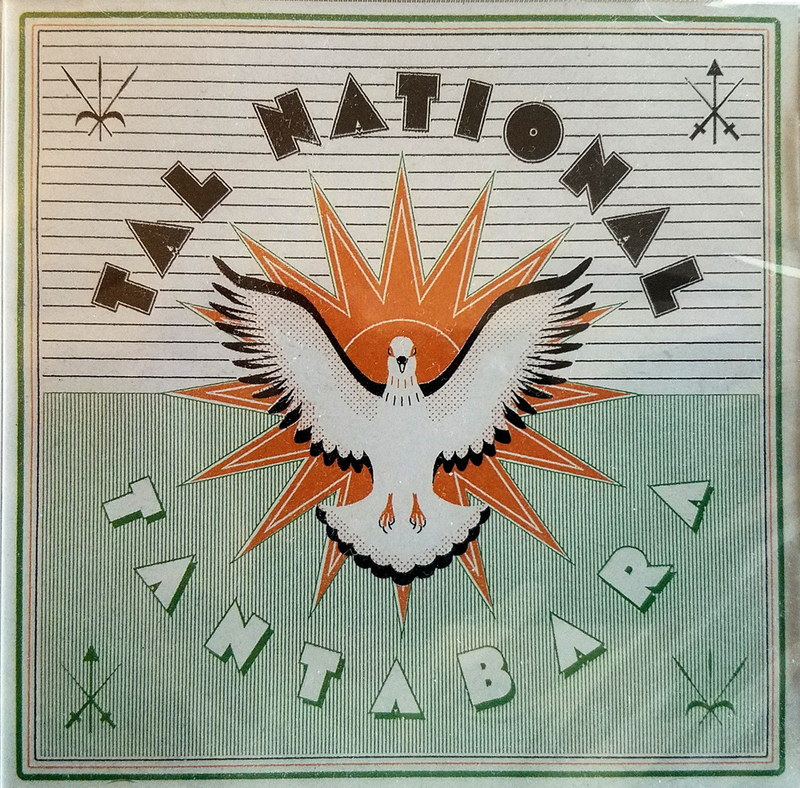 Tal National celebrated their new release with a handful of US dates. Kaleta and the Super Yamba band opened for them. The band featured five members on this tour in support of Tantabara, down from seven members on the last tour. Rhythmic complexity and narrative storytelling yielded to a straightforward guitar driven 90 minute plus set. The interaction again propelled by manic drumming from the drum kit, pounding out straight rock or accelerated rhumba beats but instead of dual vocalists trading off with a chorus, Almeida played tight rhythmic patterns following the vocalist or took leads over a rhythm laid down by a second guitarist. 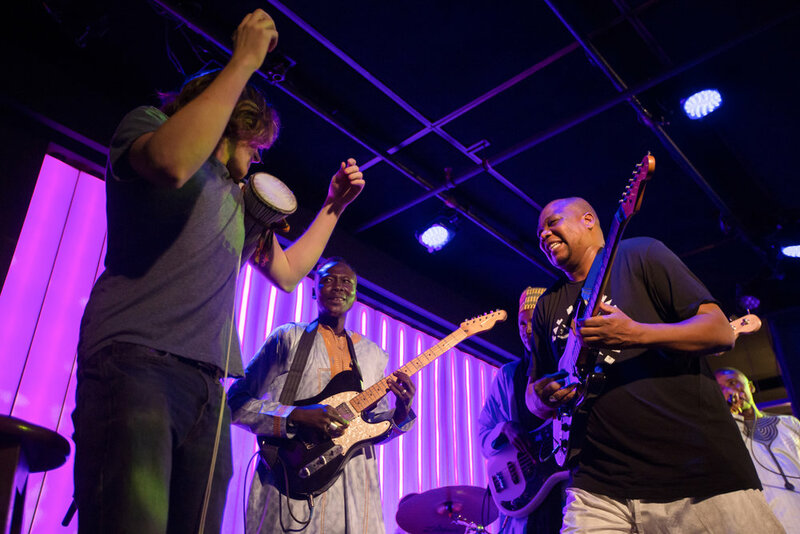 The Super Yamba band was formed here in New York after four members,DanielYount (drums)Evan Frierson (candombe,talking drum) Walter Fancourt (tenor sax) and Sean Smith (trumpet) moved here from North Carolina. The musicians were playing music inspired by Benin’s Orchestre Poly Rythmo de Cotonou, Ghanaian Highlife and Nigerian Afrobeat in A Brand New Life, a Greenpoint NC based band. 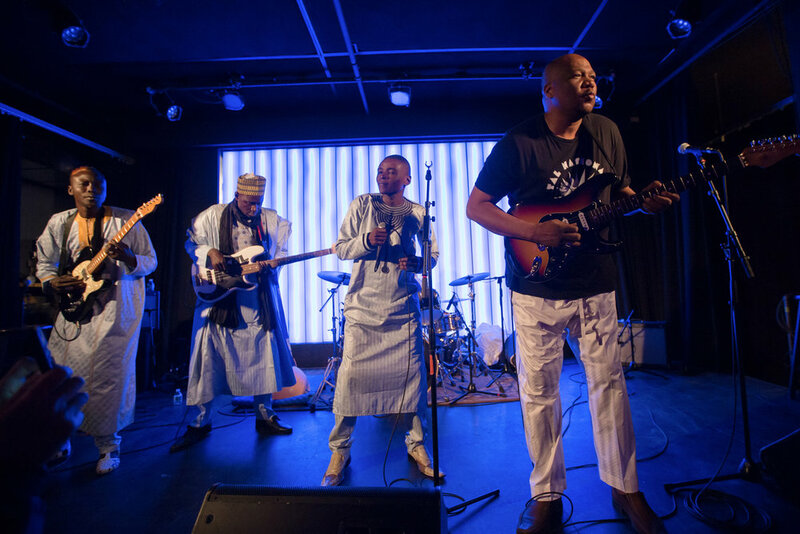 There they met recent immigrant from Senegal, talking drum player Mamadou Mbengue who mentored and perfomed with them until they relocated to New York City. They met bandmates Marcus Farrar (percussion) Doug Berns (Bass) William Donovan (guitar) and Daniel Sheffield (vibraphone) and formed the Super Yamba band. 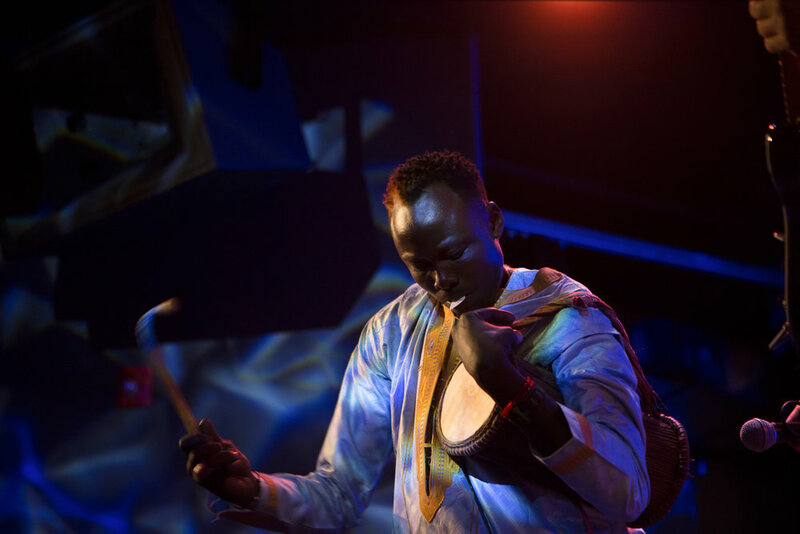 Evan Frierson of the Super Yamba band, left, playing talking drum invited onstage by Niger's tal National at Littlefield. 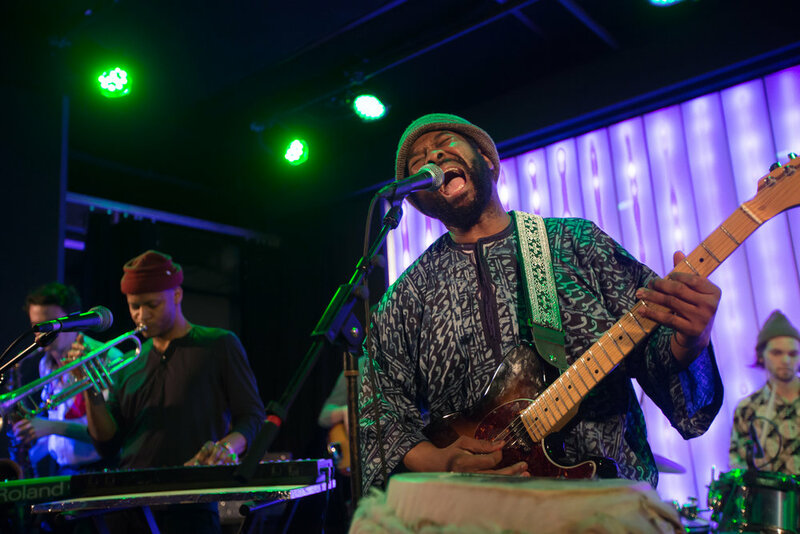 Kaleta was born in Benin but grew up in Nigeria where he absorbed the red hot Afrobeat scene and joined King Sunny Ade’s bandand later toured as a guitarist Fela Kuti’s Egypt 80 ensemble. 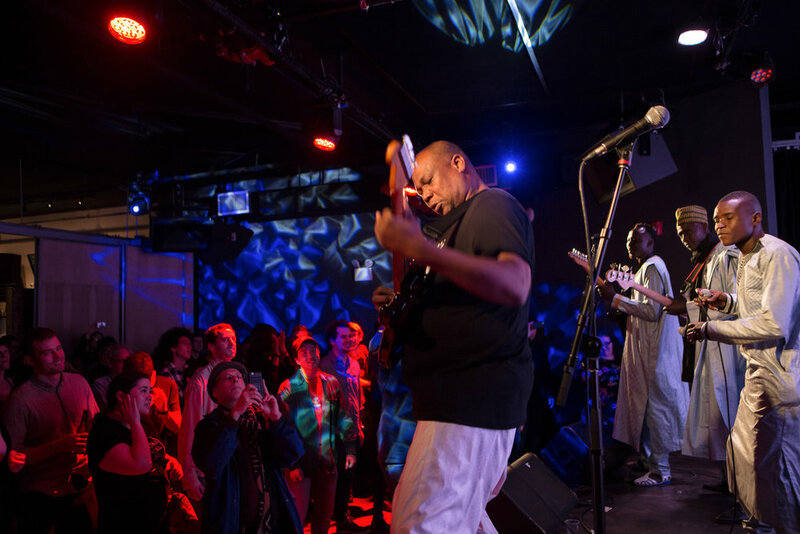 The Super Yamba band, looking for vocalists to join them in the studio was introduced to Kaleta, who had been leading his own band in New York and the meeting grew into the current collaboration, recording together and embarking on first tour together in May and then July this summer.